What Victor and Barbara did in 2014. We had put our house on the market in mid November 2013, and the housing market in South Australia proved to be extremely slow. From January to May we had the estate agents showing buyers around regularly. This took a huge toll on us, as the physical effort involved in getting the house and garden and grounds immaculately clean and tidy for each inspection was enormous. Finally, towards the end of May we had found a buyer, and we exchanged contracts in mid-June, with a 60 day settlement, maturing on 8th August. Then we had to get into high gear selling all our furniture and most of our personal effects, as we decided to travel light and rent furnished accommodation in this next phase of our lives. The law forced us to have a fence constructed around the pool. One of the many projects in preparation for our move which we completed was the "digitisation" of all our photo albums, 35mm slides, important documents, and our CD collection. We found our NBN satellite internet service worked fairly reliably, and the speeds weren't too bad, but the annoying feature was the huge latency in excess of 1 second experienced for every new page requested. However, we were extremely happy to have an internet service at all, following the previous 6 months without any connection. Australia Day fell on Sunday this January so we had the Nagels and the Pikes around for a traditional BBQ. In February a very windy night toppled a huge tree which blocked our driveway. We had to call the State emergency service. Their team came very soon and did a marvellous job in clearing the drive. We had some hot days, and many pleasantly warm days during summer, but no scorching ones and thankfully, no serious fire danger days. Winter arrived early, on 24th March we had our first really cold day of the season, and had fires lit, but this was followed by a respite, and Victor had his last swim on 9th April, with the pool at 19 degrees and the air at 23 degrees. Toward the end of April the Glenie family invited us to share their house boat on the River Murray for a couple of days. This was an enjoyable and different holiday and a great family get-together for Barbara, as the Nagels and the Pikes also came to Renmark to join in. After returning home we lit the wood slow combustion fire, and continued to do so every day until we moved out of the house just before settlemnt day in early August. At the end of May Barbara flew to Sydney to spend a week with the Glenie family. In June we bought a new car, a Holden Captiva "compact SUV". Victor had a medical check up and was diagnosed with mild diabetes type 2. We had steadily been selling furniture using the online site "GumTree", so the house was beginning to look empty. In July with great regret we sold our baby grand piano to a lovely Vietnamese lady. We sold our "bute ute", the Toyota Hilux workmate, again via the GumTree website. We packed up cartons of books, music and personal effects, which we shipped to Karen in Ipswich, Queensland. 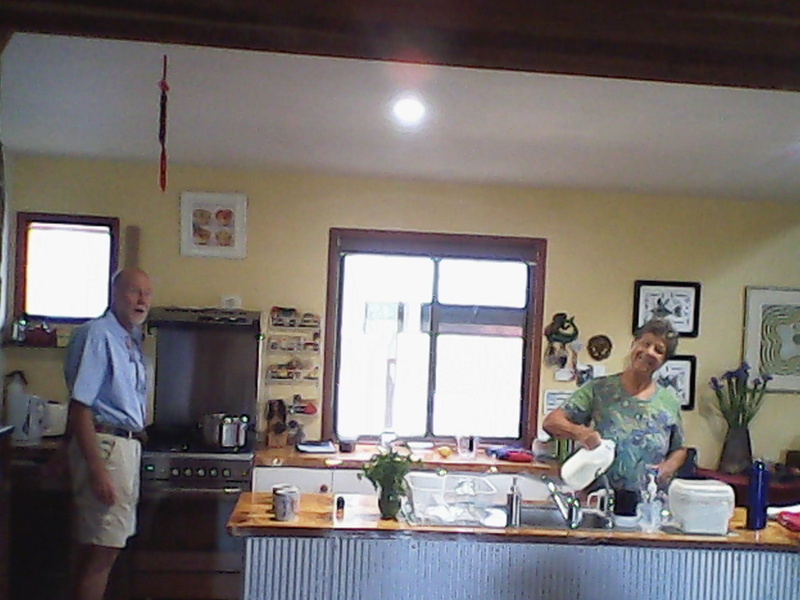 We visited Roslyn who was staying at a lovely beach house in Goolwa, near the Murray mouth. On 5th August we moved to a cabin at the Gawler Caravan Park, so we could sell our bed and clear the last items from the house prior to settlement day, 8th August. Finally we started to drive northwards on 12th August, heading for Sydney, with overnight stops at Balranald and Gundagai. Barbara caught up with Kim and the Glenies for a few days, then we stayed overnight at Taree and Ballina NSW, arriving in Ipswich Queensland on 20th, where we stayed with Karen and family. 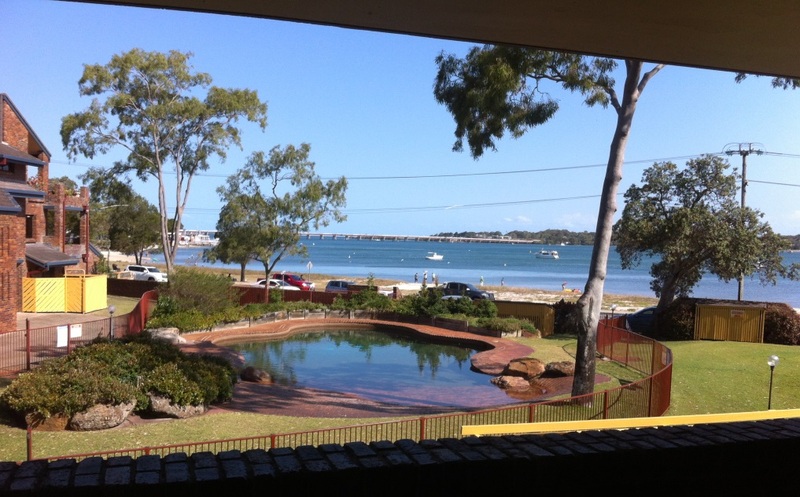 We stayed for 2 weeks at a holiday house on the ocean beach of Bribie Island, and from this base we explored the island and looked for more permanent accommodation. 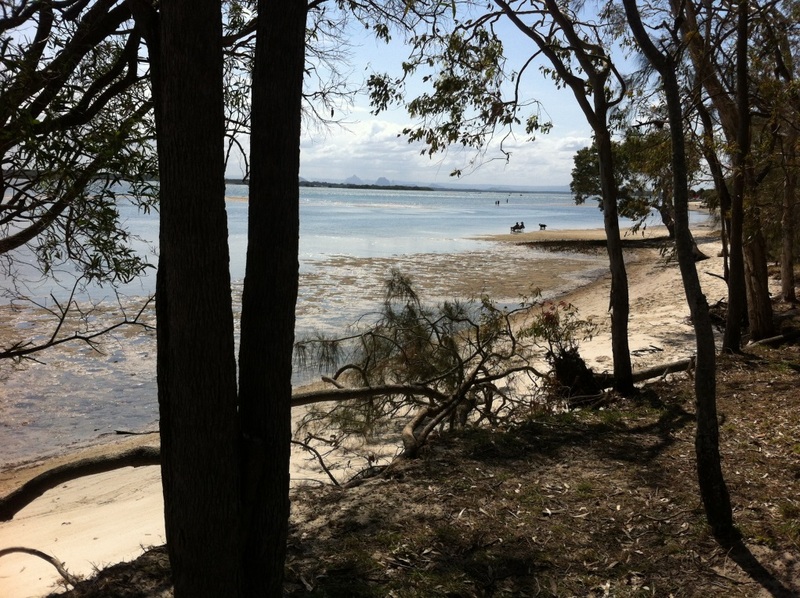 Bribie Island is a pretty place in Moreton Bay, north-east of Brisbane, connected to the mainland by a longish bridge. We found a furnished unit in a complex of apartments on the Pummicestone passage side of Bribie, and signed a six-month lease. We have a wide sea view of the passage and the bridge from our balcony, and the grounds and pool are maintained, so Victor's lawn-mowing, pool maintenance and chain-sawing days are over! So far, in September, the temperatures have been mild, usually ranging from about 16 overnight to 23 in the day. Being in the bay, we have a maritime climate, much cooler than inland places such as Brisbane and towns further west. Karen and family have visited us twice in September, and Mathew and Daniel both enjoyed the seaside holiday atmosphere, the pool and the beaches. Victor also drove to Ipswich for an overnighter. The drive takes just under 2 hours, on some very busy freeways and major roads. 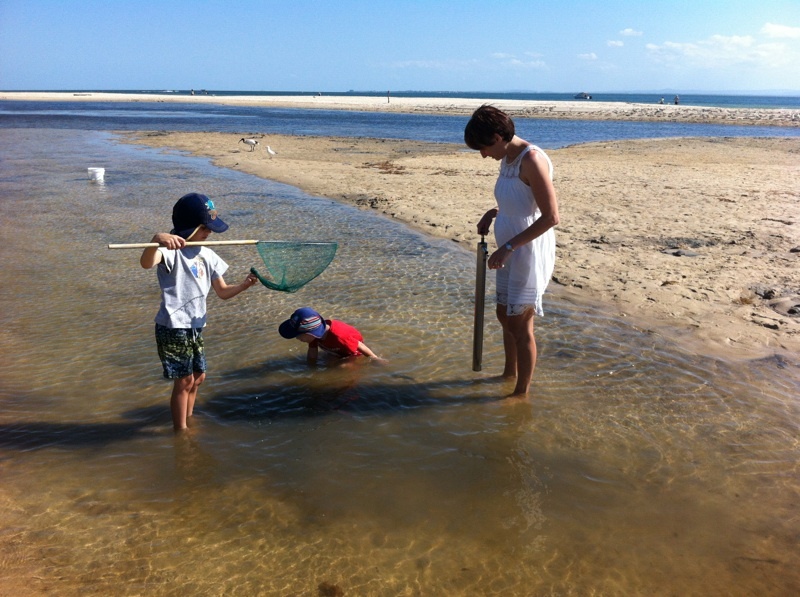 On Bribie Island we discovered a branch of U3A (University of the 3rd Age), and Barbara enrolled in Tai Chee, Singing, and Spanish, and Victor enrolled in Advanced French Conversation classes. We both joined the Bribie Island Orchestra, all keen amateurs. Barbara plays clarinet, and Victor used a keyboard to alterrnate between French Horn, Trombone, and Oboe, to fill in where those instruments were missing! In October we visited the hinterland, with its lush green rolling hill countryside, and the striking shapes of the Glasshouse Mountains.We attended a lovely concert of Viennese operetta at the Bribie Arts Centre. Karen and the boys visited us and stayed one night. 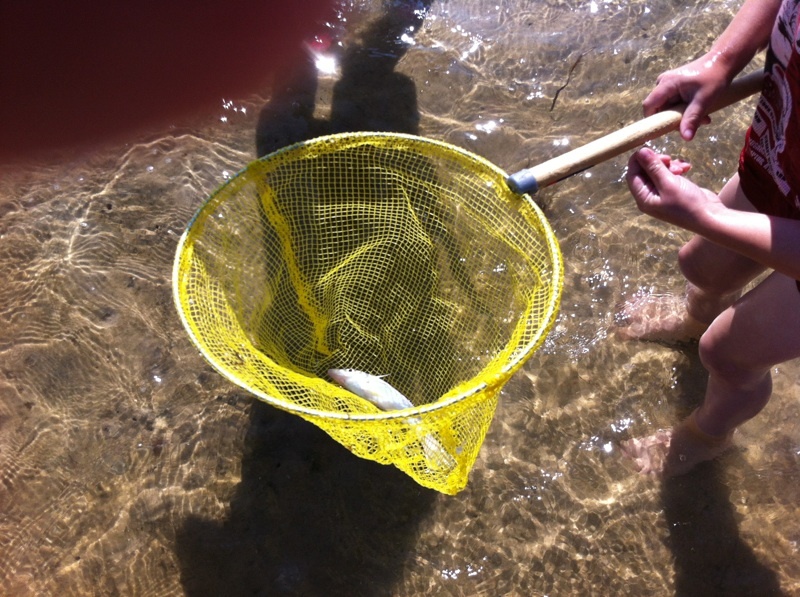 We all enjoyed a miniature steam- train ride, and catching yabbies on the beach, and watching the armies of soldier crabs marching across another beach. Barbara flew to Sydney for a week with Kim, Russel, Sam, and Alex. Robert came for a one-night visit, then Victor went to Karen's for 3 days. 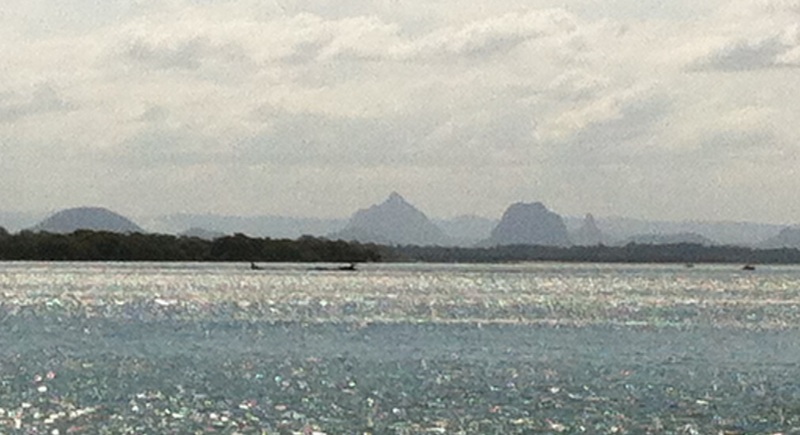 In November we enjoyed a half-day cruise along the Pummicestone passage, which separates Bribie Island from the mainland. 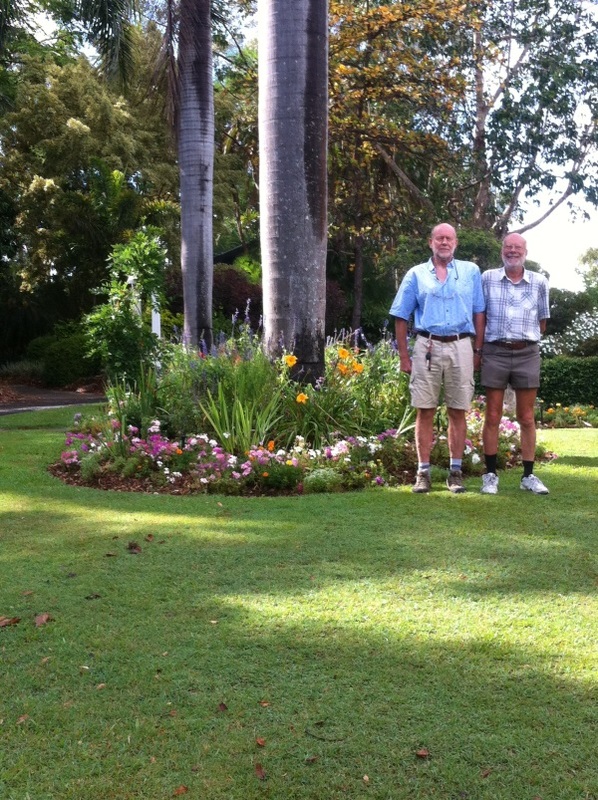 Then we took a week to drive north up to Townsville and a short ferry ride across to Magnetic Island. We inspected a rural property in the middle of the island, with a view to possibly staying there for the 6 months of winter. However the place was not to our liking, so we explored Magnetic island. We foolishly climbed a peak beside Picnic Bay in the heat of the day! The view from the top was amazing. Robert and Wendy kindly invited us to their place at Lake Alexander, for Thanksgiving. In December we went to Ipswich to listen to Mathew and Daniel play their piano pieces at an end-year recital given by the students of Mathew's piano teacher. Mathew was the first to play, and he stepped up confidently and played brilliantly! Then we flew to Noumea for a week's holiday in New Caledonia. This large Pacific island is only a 2-hour flight from Brisbane airport. The hotels were comfy and some scenery was amazing, but overall we were dissapointed. We drove round the island in a rented car for 7 days. The place is hyped up to be a magical blend of Pacific island culture with French savoir-faire and chic. We found it rather untidy, with lots of litter, some terrible slums just outside Noumea, and the prices were exhorbitant. I have uploaded a holiday narrative with photos to our travel diaries at New Caledonia. We have been invited to spend Christmas Day with Karen and family in Ipswich.